May 17, 2016 • [Source: NASA] NASA has awarded a sole source contract to Ball Aerospace and Technology Corporation of Boulder, Colorado, for the Thermal Infrared Sensor-2 (TIRS-2) instrument Cryocooler for Landsat 9. This a cost-plus fixed-fee contract in the amount of $18,249,103 million with a deliverable date of Feb. 3, 2018. This action definitizes a letter contract that was issued on Feb. 4, 2016. 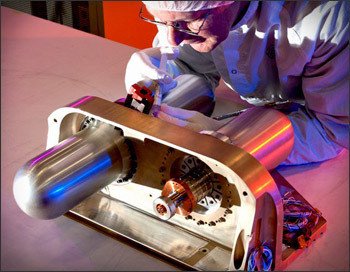 Under this contract, Ball Aerospace and Technology Corporation will design, fabricate, assemble, test and deliver a cryocooler with two stages of cooling. The first stage shall cool a layer of thermal shielding and the second stage shall cool the focal plane assembly. The contractor shall also deliver a flight model and a flight spare model of the thermo-mechanical unit, a flight model and an engineering model of the cryocooler electronics, and a flight model and engineering model of the redundant switch electronics, along with associated ground support equipment. The objective of the Landsat 9 mission is to extend the ability to detect and quantitatively characterize changes on the global land surface at a scale where natural and human-induced causes of change can be detected and differentiated. Once operational, data acquisition, reporting, operations, and archivals will be accomplished at the U.S. Geological Survey Earth Resources Observation and Science Center in Sioux Falls, South Dakota, where the current data is managed.